What a treat to learn something new? I had a fabulous time at Sujatha’s kitchen. 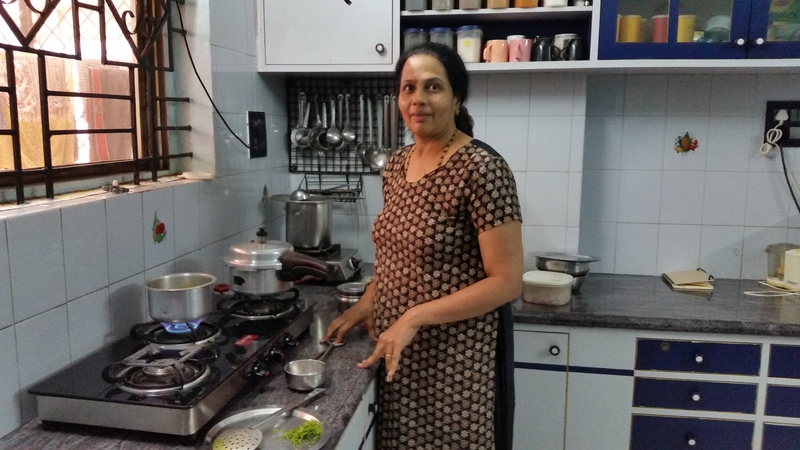 She was the perfect hostess and had prepared all of her cooking ingredients beforehand: every vegetable was chopped, the spices deftly measured, the rice and daal washed, soaked and ready to be cooked. She subsequently demonstrated the cooking process of Masale bhaat and aamti, I furiously took notes, while the heavenly aroma of all the spices filled the air. By the time the food was ready, I had learned about Kokum, Hing, frying slices of dry coconut and Goda Masala. The masale bhaat was very delicious and so was aamti in the bowl…. Cover the pot, lower the heat and cook for another 12 minutes , until all the water is absorbed. Next Stop….. Aamti in the bowl…………..